They can also be overwhelming…there are 303 Kona Cotton colors to choose from and that’s just one manufacturer! Choosing the right colors can be a pain, especially if your shopping online…so color cards can be a lifesaver. Color cards are expensive…so if you can only buy one my favorite is the Moda Bella Solids card (purchased here). The swatches are bigger and I find most of my top colors on it. The Robert Kaufman Kona card has more colors, but the swatches are about an inch square and it’s hard to get a good idea of the true color…I still love it and use it often though (also purchased here). The safest bet is to choose colors based on print fabrics I love. If I’m making a quilt, I choose my print fabrics first, and choose out a few colors from the prints to buy in solids and add into the mix. This quilt I color matched the solids to a few prints from the quilt, so it was a safe bet, but the solids still make the pattern more visible even though they are the same colors as the prints. Or, you can add in a slightly different shade of solids to mix it up a bit, like the Kelly green and the dark blue in this quilt. There is no other primary green in the quilt but with so many other greens…it works, and makes it more interesting! I’ve also found some of my favorite solids by trial and error, and from recommendations from others. I keep a big stash of my favorites that I use all the time and try to keep at least 1/2 a yard of each. My background fabrics like white (the color is below) I buy by the bolt, or wait for a sale and buy a lot of it. 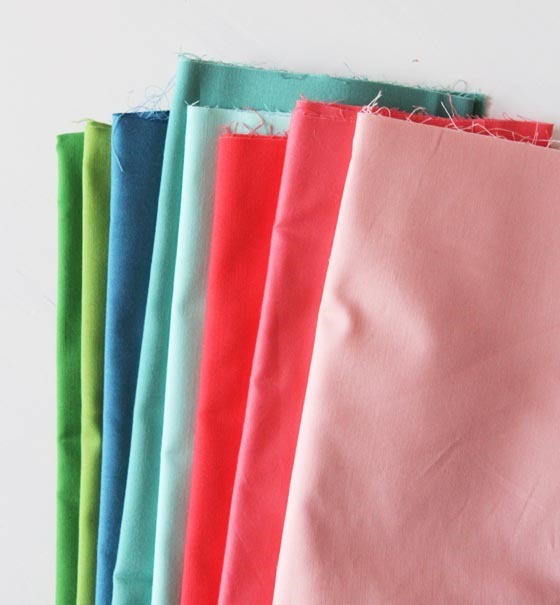 Most solids are cheaper than print fabrics…another reason to love solids! I usually add 2-3 solids to every quilt depending on the size, not including the background fabric. 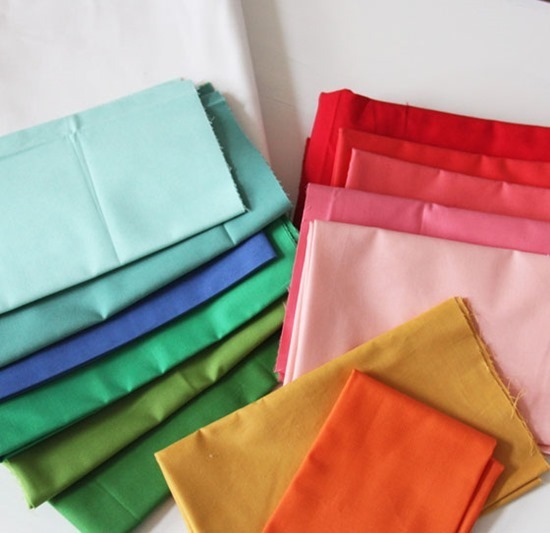 You can always buy pre-cuts of solids too… it’s a great way to add to your stash without getting overwhelmed by choices. I love buying my solids in person in a quilt shop, but I also buy a lot of my solids online. I rarely pre-wash my fabrics, including my solids. Since I’m buying mostly high quality fabrics I haven’t had a problem with them bleeding. However if you buy a dark or red solid from a chain store, definitely pre-wash it. If you have a favorite solid I didn’t mention or a great resource for solids please share in the comments below. Most of these were Kona or Bella solids because I’m familiar with them…but other companies make some amazing ones too. Shop around and see what you like best! I love the "arrow" quilt. Is there a tutorial on your site for that one? Also, I LOVE fabric. I do not make quilts,(gasp) so I never get excited about solids. (I made one in my early 20's and swore never again. I know I will be making them for grandkids and my later years.) I am so glad to read the importance of the solids. How can one NOT get excited looking at the color cards?? I follow Simple Simon and Co. too–do you know of the ladies? I shared your "Making" with them as they have kids. Love to see the beautiful quilts! Thank you for all the wonderful new suggestions. Right now, my favs are kona Curry, kona midnight & kona kale. I'm glad Kona ash still makes the list! This year I bought a bolt of Kona silver. It's one of my quilting resolutions to use more solids. I seem to only use Kona white, Kona Bone and Kona black. I have branched out a little with a quilt I finished this month (using your scrappy summer pattern) and would love to make a two color quilt sometime this year, with either pink, turquoise or yellow. The options on the cards would even make that difficult though. Kona Melon is my favorite solid ever! Found it this summer and I use it all the time! I have fallen in love with three Konas: Fog, Paprika and Ice Frappe. This is so helpful. I'm trying to build up my solids stash, and I'm finding the process so confusing, given the incredible range available. This post has really helped. My favorites next to Kona white is definitely bubble gum, pearl pink, ochre and iron. Heavens…I was hoping you were giving me that stack of solids…lol. I love solids too. When I first started quilting way back about 30 years ago,, that is all I used. I love Kona and I am hand quilting my Churn Dash right now in Bella solids. Color cards are a huge help. I just wish that the solids had a selvage with the name on it! I have a color card from Clothworks as well as Kaufman. Someday I'll splurge on the Moda card. The Clothworks(AMB) have very limited colors, but I have collected a lot of their print fabrics, so the solids are an easy match. How timely is this! I am going to the quilt store tomorrow to pick out the fabrics for a new block of the month that they are running. I have been thinking about solids and I have very few in my stash. Maybe I can invest in a fat quarter bundle. I love Kona Ash, Pewter, and Medium Grey. I also like the Hawthorne Hues solids from Hawthorne Threads. They have a limited, but very pretty color palette, and they have a reasonably priced swatch ring that comes in handy for matching colors! I rarely, if ever use solids, but you may have just inspired me enough to try. That being said, I did purchase a solid navy (Kona, I believe), and I had a heck of a time figuring out the wrong/right side of the fabric. Any suggestions?? I'm a big fan of Kona solids and haven't tried any of the others. I like Curry, and Kale, like a previous comment. These are really good for backgrounds, and not an obvious choice. I pre-wash everything and use a dye catcher. I have found the Kona blue bleed a lot. Surprisingly, not so much the reds. Can I ask how u keep track of the color name for when you need to restock? No name on the selvage makes me crazy!! I love your post about solids. I have a few and have been slowly adding to my large stock of some prints and a lot of tone on tone fabrics, and then of course there's all my Civil War fabrics. At any rate, I need, yes I said need, more solids. I like northcott color premium quilting cotton. A little harder to find and not as many color choices, but has a nice hand due to the 60×70 weave (compared to others that are 10×10). And I agree with others that I feel kona frays a lot. That said, I have used kona and the color choices are great. ****Oops, that would be 60×60 weave. I love Michael Miller solids and American Made Cottons, too. Thanks for a great post, one I must keep to hand. Living where I do in the UK means the option of choosing from a range of Kona or Bella in a store isn't feasible. (If a kind reader knows where there is a good stockist in the Midlands/North where I can eyeball these ranges then please let me know!! ) So having advice about good choices is really helpful. Please tell us how to buy a whole bolt of kona?!? Bella solids are great because they come in lots of colors, but even my LQS has begun carrying American Made Brand (AMB), which I LOOOOVE (see – all caps and lots of Os!) When they didn't have basic black that I needed for a border, I went online and ordered it. (I've used Bella Black before, and it frays like crazy. Didn't want to go there again!) Thanks for encouraging us all to use solids. I am trying, but practice (and gentle prompting from some favorite bloggers!) is still needed! This is the BEST information on solids I've ever seen – thank you so much! I want to make a yellow/white quilt and couldn't remember which yellow you suggested….curry – lovely! I lean towards the Kona only because I think the quality is nice. I was so disappointed with Moda Bella in White my last experience with it. I recently bought a stack of Peppered Cottons, and all I have to say is, O.M.G. 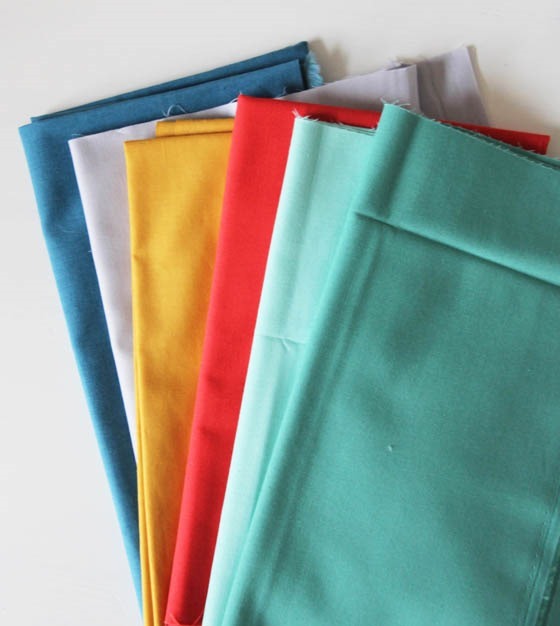 I have been ordering some of the Timeless Treasures solids, they seem to have a finer hand than the Kona cotton which I find frays fairly easily. Unfortunately they do not have a color card available to the public, but they say that quilt shops have them. Maybe a nudge from you would get them thinking about a color card. Thank you for this post. I see lots of quilts that use solids and I wasn't sure how to use them in my quilts. I think I'll try it now!! I too love solids with a capital L! My favorites are Cherrywood, I want to dive in and live in them! But I will check out the Moda Bellas. I'm kind of picky about texture and as beautiful as the Konas are, I don't always love the texture. I use 'em though, because the color sometimes trumps texture, you know? 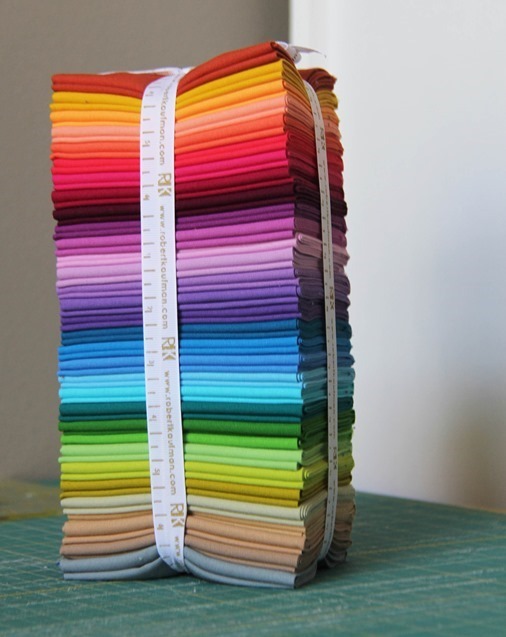 Unfortunately I don't have a local quilt shop to purchase solids from but I recently discovered fabric shack online. I think they have all the colors of Kona, are $5.49yd, shipping is $3 and they sell in 1/4yds too. Just thought I would share for anyone in the same predicament. I rarely ever used solids until I did a blog hop requiring Kona solids about a year ago. I fell in love with them! I use them often now! I use mostly Kona and have one of their cards. 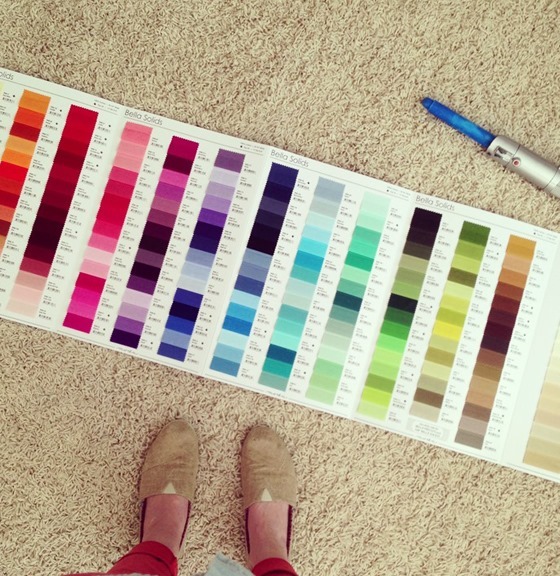 Curious like another commenter on how you keep track of the color/manufacturer in your stash. Do wish everyone would sell with a little label listing the name. Solids are awesome! When I am shopping online and find myself a little short of the required $ for free shipping, I'll pop in a couple half yards of a solid so I can keep building my solid stash. I use mostly Kona and Bella, but Art Gallery has some awesome solids. Great colors & super soft. I have also experienced bleeding with Kona Navy and Kona Celestial. I prewash because I have a sensitive smeller and sometimes the dye smells get to me. I want to make an all solid quilt one day. This is such a great post. I hadn't realized that you could get the color swatch card from other manufacturers than Kona! Also, love your comparison of solids to mascara! I must admit that I'm just now starting to get the idea into my brain that solids are good to use and add more interest into a quilt like you! As I grow I will try to add more solid as I go along. Thanks for sharing your knowledge. As always happy quilting. Love this post, thanks! I just bought a Kona color card and am slightly disappointed about how small the swatches are but still love looking at all the pretty colors. Now the question is, where on-line do you buy your Kona solids? Patti – I used to pin a little paper with the name on it to the fabric..but I've gotten out of the habit. I wish they had the names on the selvage!! Datarhill- I've bought a bolt from fatquartershop.com or straight from the distributors before. Britney – I buy mine from fatquartershop.com, cantonvillagequiltworks.com , pinkcastlefabrics.com and someone mentioned fabric shack above. I'm also lucky to have a quilt shop with a great selection!! My go-to solids that I use frequently are Kona Medium Gray and Kona Coal. I also love Kona Snow. I find the Michael Miller Cotton Couture solids to have a lovely hand – almost like lawn – but they're very fine and see-through, especially the lighter pastel colours. Moda Bella Solids are nice, too. The hand of the Art Gallery solids is beautiful – the weave seems a bit tighter, though, and while it looks lovely with a lovely sheen, my machine's tension goes bananas whenever it needs to sew them. Thanks for spreading the word about how versatile and exciting solids can be! Many, many traditional quilters are of the belief that solids looks "flat" and don't give your quilt movement and dimension but I completely disagree. 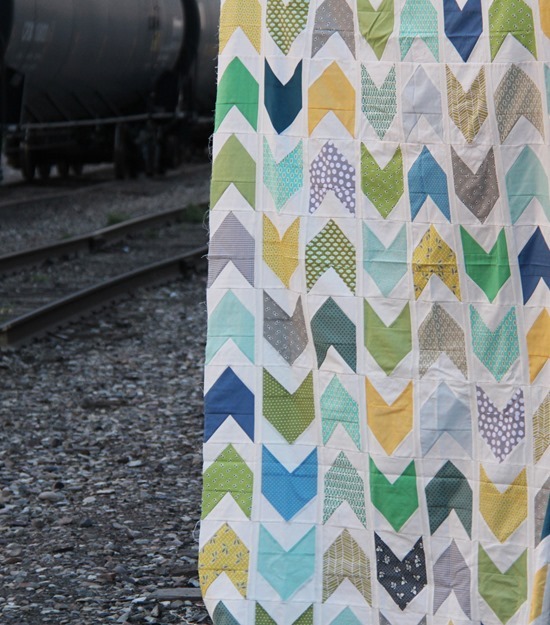 I love working with all solids, and work them into nearly every quilt I make regardless. Thank you for all the great info! 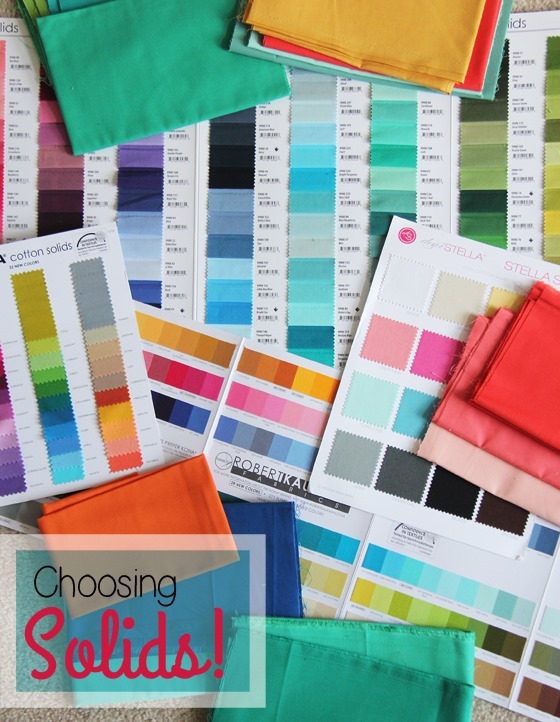 Good input for thinking ahead when purchasing fabrics or planning a quilt. I recently have found American Brand Solids and love the fact that they are made in America – not sure, but maybe in Washington or Oregon (up your way). I bought a few solids to try and I believe the are a little cheaper too. I love Kona solids!! I use Moda Bella solids also, especially if I am coordinating with their prints. I really need to purchase color cards! Thank you for your inspiration!! I appreciate so much your suggestions and comments on using solids! I love Kona solids, but will check out the Bella cottons. Are they comparable? I, too, choose my print fabric and then incorporate the solids. Found it to be a great way of including solids! I just wanted to echo what a helpful post this is along with the comments. 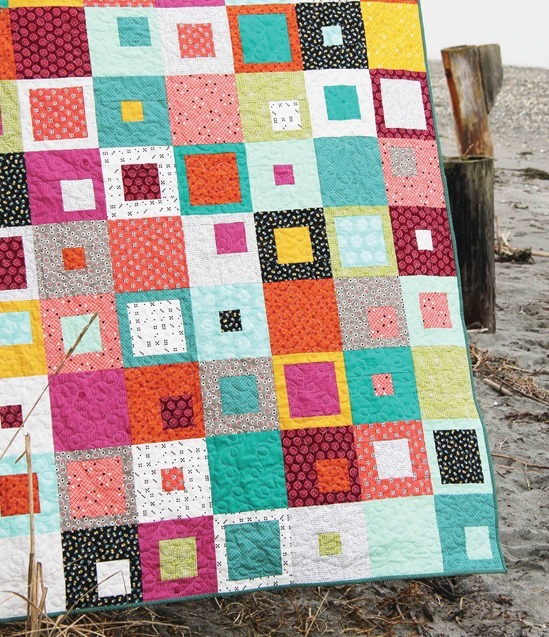 I also love Moda Bella Ruby Ice, having seen it used by others, but haven’t yet made my own quilt with it yet. I have a Moda color card and usually buy from Thousandsofbolts.com for 4.95 a yard. I so love the solids from Connecting Threads. Good quality and price, I live pretty far from a quilt shop that carries solids, so I shop online sometimes. I should see if they have a color card…I do love their solids too! I have a tip for labeling the colors – use a Frixion pen to write on the fabric. Some people don’t like to use these pens because sometimes they leave a “ghost” when heated but it does not matter if you write on the selvage. I store my fabric on comic book boards and write on the fabric if I want to keep up with what collection it is from, what color it is (if solid), or the yardage (if there’s more than a yard). my favourite solid is kona wasabi. I have often battled how to keep track of the names of my solids, Kathy (above) has a fantastic idea! I saw mention of safety pinning a little label to each piece so you know what color it is. Then if you need/desire more, you’ll know the name of it. I do this with my solids, Oakshots, Kaffee shot cottons and Studio E Peppered cottons, and actually any of the solids or near solids in my collection. That saves a multitude of grief. Even though the dye lot might not be exact when you go to buy more, at least it will be closer than a hit-and-miss. Thanks for these suggestions! I’m a few years late to the conversation but as for marking/remembering, I often just write the name on a post-it, stick it on the fabric, and run a pin through it to make sure it doesn’t fall off. I am trying to settle on ONE “off-white” background color so that I can buy a bolt and always have it on-hand. I seem to most-often choose either kona or Bella Snow (of course they both have a SNOW! ), depending on where I’m shopping. Kona is more easily available at a large chain store, but I tend to buy Bella prints. What I REALLY wish is that manufacturers would list the best background solids to blend with their collections so on-line shopping were easier. Me too! It would be SO much easier to have the color on the selvage!! I love Bella 200, it’s like a mix between the cream and the white.